Make sure that your font is consistent. Use ONE font and make sure all your contact info is clearly on there. Use your corporate font and stick to it. Embossed lettering will make your type pop a little bit more and it looks especially nice when you print onto a matte card. Gloss on matte always create a good tactile feel and this has a significant impact on your impressions. Sometimes a good place to look for inspiration is on packaging. Be sure to leave a fair amount of white space. The idea is not to cram as much crap onto your card as possible. Put the bare minimum and be on point. White space is just areas where you have no design. It makes your eye focus to a point where there is type or design. Driving the eyes through design placement will help make your information easily accessible. You mean business. In SOME occasions, you can get a little more clever with your card messaging, but you can easily run the risk of coming off as being tacky. Sometimes a mantra (3-5 word phrase about what your company does) can work in your favor. A bunch of pictures and a discount code will not. The essentials are your name, position, email, website address and possibly your phone contact info. Do NOT go cheap with your paper selection. Use 16pt or 100lb stock at MINIMUM. Anything less and you look like an amateur so don’t do it to save ten bucks. You can actually use a number of different materials out there. 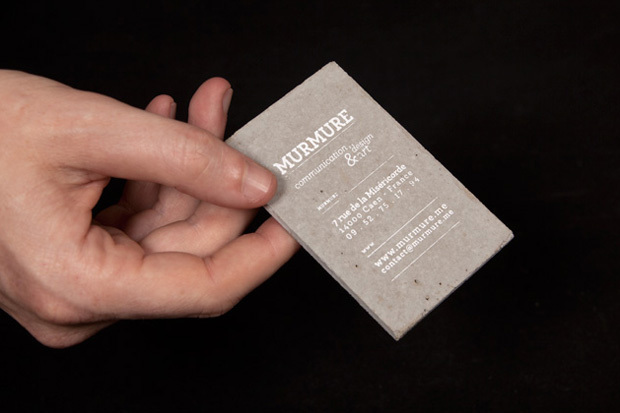 Hypebeast recently did a post on Murmure who is now offering concrete business cards. 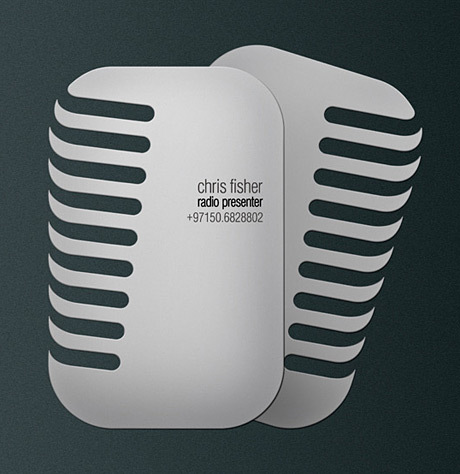 Aluminum business cards are a certain way to get the nod. Some may see your card as being excessive or a little over the top, so be careful with making sure that your cards are appropriate for where your business is at. If your balling out of control or want to at least come off as looking like that, then this is fine. If you’re a bootstrapped startup handing out $5 business cards to an investor, you’re going to be perceived as a spendthrift. Don’t even BOTHER with the goofy sizes out there. Those little moo cards just get lost and tucked into the bottom of a credit card slit. Reminds us of chewing gum. Screw that. Get the standard 3.5″w x 2″ tall and nothing else. You can play with rounded corners if you want, but do not get goofy with the size or a silly die-cut. Remember to make a bleed when you do your design (this means your design needs to be on 3.75″x2.25″ so that when you print and cut the cards, you don’t end up with some white edges on the cut. If you are IN the design business, you better have a nicely designed card. It is ok to put a little of your style into the card, but keep in mind that the style needs to resonate with your clientele. This entry was posted in Art/Design and tagged aluminum business cards, branding, business cards, business development, design, marketing by Lief Storer. Bookmark the permalink.